Cult film club: The thrill of the hunt. It's the ultimate drug, and the more intense the rush, the higher the price. International superstar Jean-Claude Van Damme teams up with world-famous action director John Woo for this electrifying thriller that WGN Radio hails as "Easily one of the year's best films!" Van Damme is the target of an evil mercenary (Lance Henriksen) who recruits homeless combat veterans for the "amusement" of his clients - bored tycoons who will pay a half a million dollars to stalk and kill the most challenging prey of them all: Man. Laced with dark humor and slam-packed with electrifying action Hard Target is a must see for action fans. 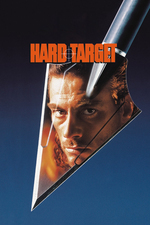 I like HARD TARGET, though I can't pretend it wasn't a disappointment after the intense and nearly overwhelming HARD BOILED. The director's cut is longer, a little more violent, and a little better than what eventually got released. Sorry, it's probably not a "director's cut" -- I have a bootleg of a work print that was sold as a "director's cut." Still, a little rawer and more idiosyncratic than the release version. I didn't really know who John Woo was when I saw this, and I wasn't exactly a fan of Jean Claude van Damme, so I have no idea how I ended up seeing this, but I recall thinking it was considerably better than it had any business being. That still doesn't make it a great movie, of course, but given the utter crap it should have been... it wasn't so bad. Looking back with more understanding and appreciation for John Woo, and Chow Yun Fat, it's kind of a shame that Hollywood loved them so much it took them out of their native environment and pretty much killed them, like a kid who wants to keep a pet frog or something. Chow Yun Fat was equally wasted in the really stupid Replacement Killers, which was basically Antoine Fuqua being given all the pieces of a John Woo movie and trying to build his own from a kit, and then his U.S. career went nowhere fast. Well, John Woo will always have Face/Off. Chow was kind of DOA in the U.S., sadly.